The first look at the titular character Dora from next year's live-action Dora the Explorer movie has been released online, and it is surprisingly accurate to the source material. The image shows the movie's star, 17 year-old actress Isabela Moner, in full costume as the famous children's' show character. The image was first shown by Paramount Pictures, and later shown on social media by Isabela Moner herself, who was excited to show off her new look to her Instagram followers. The image has a brighter tone to it, with the colors of her outfit perfectly matching the bright cartoon colors from the original TV show. This proves that the movie will indeed be lighthearted, as opposed to what many others thought it would be. Back when the live-action Dora the Explorer was announced last year, a number of people jumped to the conclusion that it would be a dark and gritty live-action movie. This was largely due to the rumor that Michael Bay would be helming the production, as he has a nack for taking children's shows and turning them into action-packed, explosion-filled popcorn flicks with incredibly dark and gritty tones. This theory was also partially spawned from the viral video by College Humor in 2012 that reimagined Dora as a gritty agent, played by Ariel Winter. Alas, these dark and gritty rumors are finally put to rest as the new image seems to be the exact opposite of dark and gritty. It looks as though the live-action Dora the Explorer will be exactly what the name would suggest: just a real life version of the animated series. While this may disappoint the people who wanted to see Dora fighting off mercenaries and walking away from explosions in slow motion, it will certainly appease the people who just want to bring their kids to a fun, family-friendly movie that will teach them something in the process. Here is the official synopsis for Dora the Explorer released by Paramount alongside the new image. "Dora the Explorer stars Isabela Moner (Transformers: The Last Knight, Sicario: Day of the Soldado, Instant Family) in the film's title role. Having spent most of her life exploring the jungle with her parents nothing could prepare Dora for the most dangerous adventure ever - High School. Always the explorer, Dora quickly finds herself leading Boots (her best friend, a monkey), Diego, and a rag tag group of teens on a live-action adventure to save her parents and solve the impossible mystery behind a lost Inca civilization." In addition to Isabela Moner as Dora, the movie will also feature Micke Moreno as Diego, and Academy Award nominee Adriana Barraza as Abuella (Dora's grandmother). The movie is set to be directed by James Bobin, who is best known for directing 2011's The Muppets, Muppets Most Wanted, and Alice Through the Looking Glass. 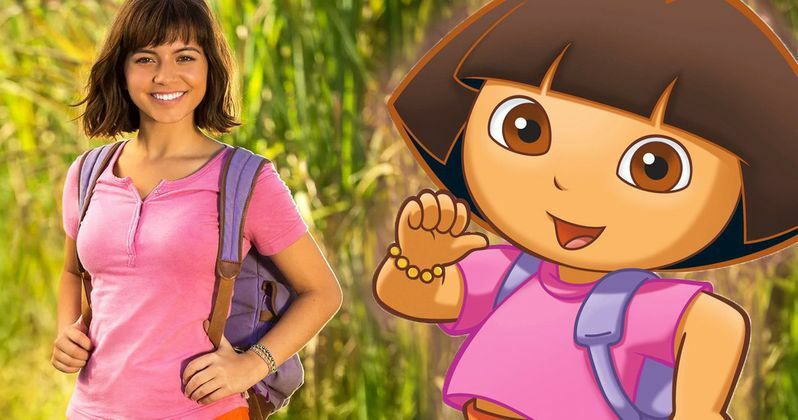 Based on the first look and synopsis from Paramount Pictures, the live-action Dora the Explorer will be different from the animated series in its plot, but still thematically similar. You can see Isabela Moner as Dora when Dora the Explorer hits theaters on August 2nd, 2019.